Diesel and EDUN have more than a love of denim in common. They also share—who knew?—a passion for Africa. This kinship revealed itself in January 2012 when Diesel founder Renzo Rosso and EDUN's Ali Hewson and Bono traveled to the continent to size up each other's programs: Diesel's Only the Brave Foundation initiative in Diori, Mali, and EDUN's Conservation Cotton Initiative in Uganda. 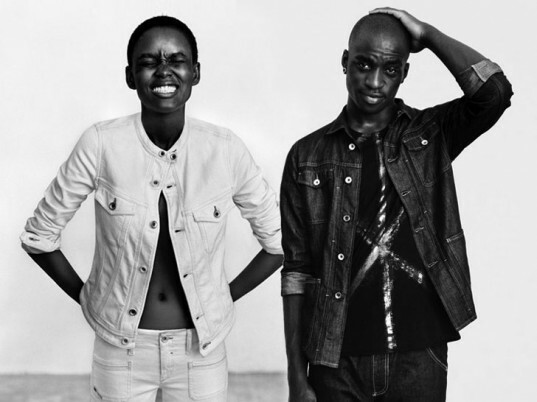 The two brands decided to join forces to promote apparel trade and development in Africa, and Diesel + EDUN was born. Available online and in stores this month, the 25-piece collection is sourced and made entirely in Africa using CCI cotton from Uganda. The co-designers didn’t have to look far for inspiration. The four-pocket jean of the 1970s, popular on the streets of South Africa (and reinterpreted using raw, untreated denim), served as the lineup’s thematic touchstone. Everything else just fell into place. Drawing from Malian prints to Zulu weaving patterns, the entire line is a pean to Africa. The entire collection is a pean to the continent. Malian textile prints reveal themselves in the denim lining and across the jersey pieces, while embroidery details echo traditional Zulu weaving patterns. Kenyan metalwork glints off the dresses. Other running themes? Four Dogon-inspired motifs—unity (“together we will shine”), creativity (“through love we inspire”), fertility (“through opportunity we grow”), and eternity (“forever we are stronger”)—designed to embody the ethos of the collection. To celebrate Diesel + EDUN’s launch, the companies devised the concept of “Studio Africa,” a “virtual loudspeaker” for the next generation of creative talents from the continent. The campaign, which will appear in 100 Diesel stores and windows around the world, including Paris, London, New York, Tokyo, and Cape Town, features nine artists in fashion, film, music, literature, and photography, including Flaviana Matata, a model who runs a foundation for the education of orphaned girls in Tanzania; Sy Alassane, an actor who creates opportunities for Senegal’s talibé beggar children; and Baloji, a Congo-born, Belgium-raised rapper who is challenging outdated definitions of African music. The co-designers didn't have to look far for inspiration. The four-pocket jean of the 1970s, popular on the streets of South Africa (and reinterpreted using raw, untreated denim), served as the lineup's thematic touchstone. Malian textile prints reveal themselves in the denim lining and across the jersey pieces, while embroidery details echo traditional Zulu weaving patterns. Kenyan metalwork glints off the dresses. Other running themes? Four Dogon-inspired motifs—unity ("together we will shine"), creativity ("through love we inspire"), fertility ("through opportunity we grow"), and eternity ("forever we are stronger")—designed to embody the ethos of the collection. To celebrate Diesel + EDUN's launch, the companies devised the concept of "Studio Africa," a "virtual loudspeaker" for the next generation of creative talents from the continent.